Christmas Eve is finally here! I want you to try something new this year. When you wake up in the morning; I want you to see the day through a child’s eyes. Everything is better with a little anticipation feeding the excitement. You have worked very hard to get ready for Christmas. Do not allow bad memories to overshadow these days. My mother died on Christmas Eve. Instead of being sad, I choose to remember her childlike excitement for the season. We can have fun and make new memories. If you are traveling please allow plenty of time to get to your destination. If you have the pleasure of being home; then pace yourself. Take time out each hour to sit and rest. Put on some of your favorite Christmas music. Yesterday I listened to a wonderful old book as I baked and made boiled custard. My book was Little Lord Fauntleroy. In the past I have listened to Christmas Jars and books by Debbie Macomber; time flys for me when I am enthralled in a good story. Let’s not forget the real reason for Christmas. Get out your Bible and read the story of the Birth of Jesus, Luke 2; 1-20. God gave us the greatest gift of all! I have two favorite Christmas Songs; Silent Night and Let There Be Peace on Earth. I intend to listen to them a lot over the next two days. May the joy of this season last all through the year. 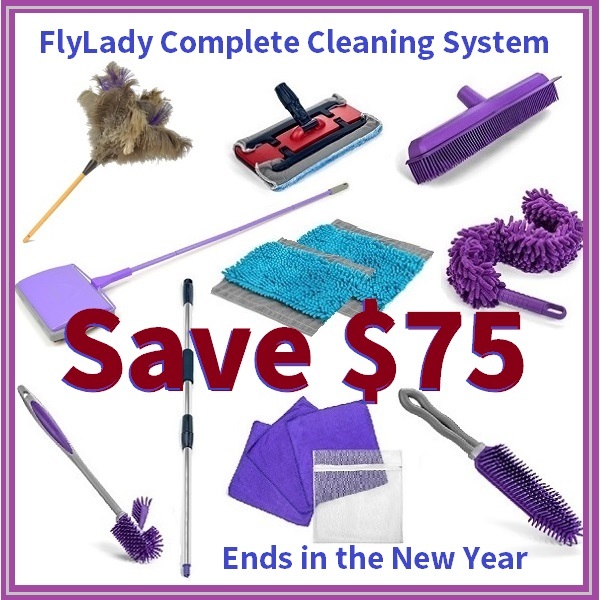 Our FlyLady Cleaning System can help get rid of the CHAOS in your home. Here is a Video Playlist that shows you how to use our FlyLady Cleaning System. Purple Rags are half price; inventory is getting low! Get yours before we run out! The Speedy Carpet Sweepa is my favorite tool for 2 Minute Challenge. Get yours ordered today because they are flying out the door. Save 20% with Coupon Code CLUTTER262. Use Coupon Code CLUTTER262 to save 20% on your new calendar! This entry was posted in Morning Musing and tagged Christmas, flylady, get organized, organized, peace. Bookmark the permalink.